We want to see a better world…one where compassionate leaders make decisions that benefit people, other animals, and the environment. Through the Roots & Shoots free online course, we’re providing training and support to educators who share in this vision. 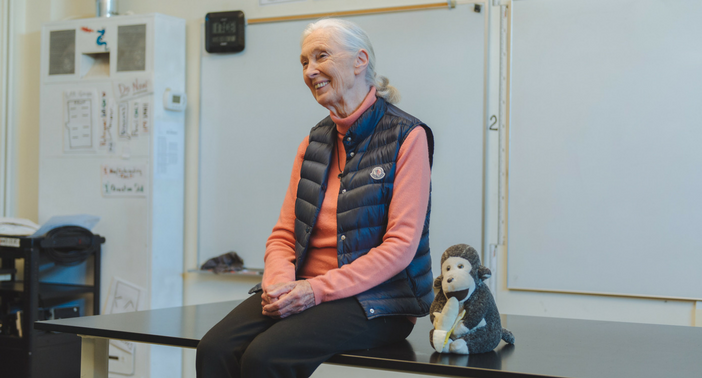 Jane Goodall’s Roots & Shoots has delivered professional development to educators for more than 25 years. The new and improved free online course, “Growing Compassionate Young Leaders Through Service,” is an innovative, professional development training for educators that teaches participants to effectively identify and implement a service learning campaign with youth. 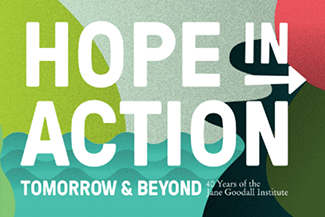 The course is driven by Dr. Jane Goodall’s message of hope and vision for a future in which compassionate leaders make the right type of choices to improve the lives of people, other animals, and the environment. 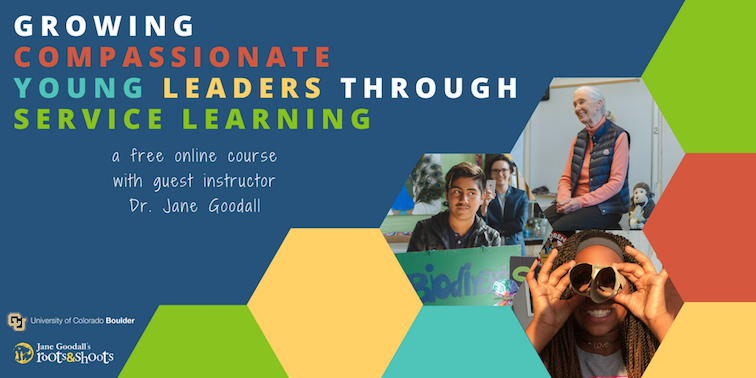 Through the course, educators gain access to more than 13 hours of training, curriculum materials, and a network of global change-makers who share in their vision for a better future. We’re excited to announce that the newly updated 2018 course is offered in collaboration with the University of Colorado Boulder’s MOOC program and Coursera. CU Boulder is committed to inspiring innovation in teaching and learning, expanding access to education, and shaping the global leaders of tomorrow. We’re all in this together. 1. The course is FLEXIBLE and FREE. The 5-week course runs year-round so you can take it when it’s convenient for you. Start your training over a long weekend or save it for your poolside Summer vacation. If something comes up and you fall behind, you’ll be able to return whenever you want and pick up where you left off. Course participants spend an average of 4-5 hours a week completing lessons and activities before the next week begins. 2. The course is for YOU. 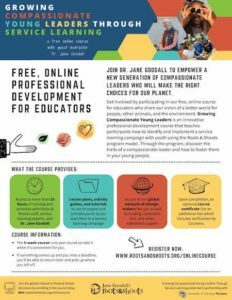 All kinds of leaders and learners have taken the Roots & Shoots online course including classroom teachers, homeschooling parents, non-profit coordinators, community group leaders, and youth leaders. Even if you’re brand new to Roots & Shoots, if you want to start making a positive difference in the world, this course is a great place to start. 3. You’ll gain access to a global community + unique opportunities. Through the course, participants gain access to a global network of change-makers as well as project funding, classroom kits, and other opportunities and support. 4. Dr. Jane Goodall is a special guest instructor. The course is driven by Dr. Jane’s model, mission, and vision for the Roots & Shoots Program. Dr. Jane joins the course with weekly lessons as a special guest instructor. Click here to read more about Jane as an educator. 5. You’ll learn how you can make a difference. Through the course, you’ll learn how to mentor young people (or your peers) to lead change in your community by mapping needs, collaborating with stakeholders, and designing practical solutions in the form of campaigns. Read about some of the service campaigns led by previous course participants here. Join us as we aim to graduate another class of impressive change-makers who are ready to roll up their sleeves and complete meaningful service projects in their communities. Next Article Want to Be Like Jane Goodall? Join TEAM JANE!